Imagine machining a piece of raw material about the size of a barn door. Kind of mindboggling, isn’t it? Well, if you work in an industry like aerospace, automotive, construction equipment and oil country products, that’s just another day on the job. Machinists who need to churn out huge parts on a regular basis know there’s really only one thing to do: Go big or go home! 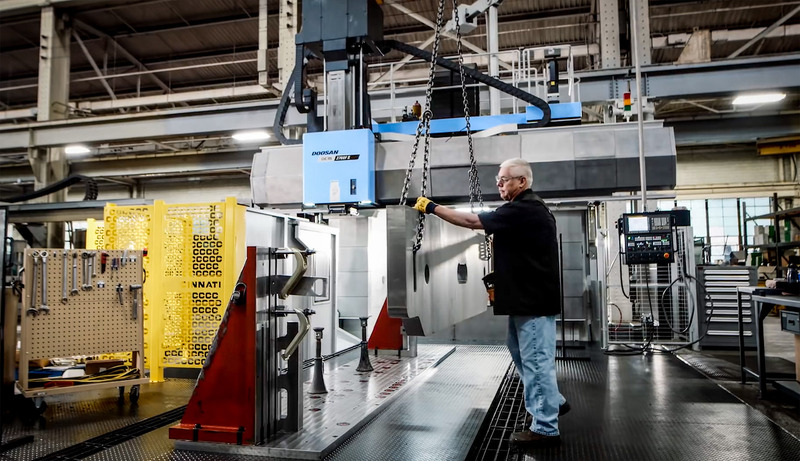 That’s why Doosan has a full range of massive machine tools specifically designed and constructed to cut the biggest, baddest job down to size (and we mean that literally). We don’t believe that scaling up means skimping on quality. Big or small, the fundamental rules for precision machining still apply. We’re talking things like accuracy, thermal stability, power, rigidity and vibration dampening. Delivering the superior performance you expect from Doosan all stems from the extra care we take with machine construction. For the highest rigidity and vibration dampening, the structural members of our machines are made of cast iron, instead of steel fabrications.. From aluminum to titanium, these machining monsters cut parts like butter. Big is good, but every industry has its unique needs. We’ve designed different features into our big machine lineup so you can pick the model that fits your application. So, let’s find out a little more about the Doosan big dogs. Got a part over 10 feet wide? The DCM series has up to 3700 mm (12.1 feet) of space between the columns. Even the smallest DCM model gives enough clearance to use a right angle head out to 2500 mm (8 feet). The ram cross section adds rigidity so you can machine at the far end of the stroke without chatter. That’s the kind of thing you appreciate when you’re using super-sized tools and massive heads. If your parts mix requires a bit more flexibility, you might opt for our BM series. The crossrail on the BM is fixed so parts about a meter high are a good fit. However, the fixed envelope lets you achieve a higher feed rate with smaller parts. You can also nest parts on one big block of metal and economically “whittle out” a batch of brackets with one setup. Win-win! By the way, a Work Load Counter Control, which adjusts the axis drive motions to accommodate different weights, is available as an option on both the DCM and BM models. Most parts that need to be bored are done on a normal-size horizontal machine so the process can be sped up with a pallet changer. But if you’re in oil and gas country, or you make excavation or heavy construction equipment for a living, the sheer size of your parts will force you to step things up a notch. The speed and power of the DBC series makes it perfect for these applications. 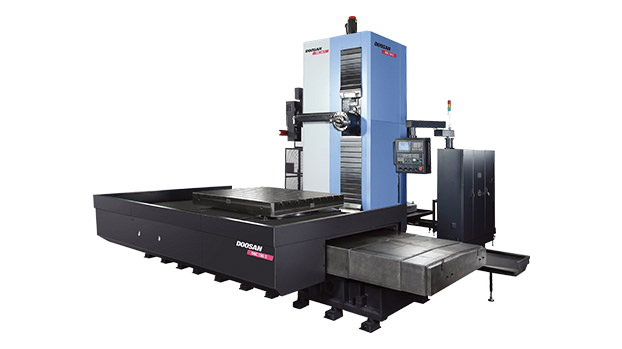 The VTR1216 features a ram tool indexing system for heavy-duty cutting and high machine rigidity even with maximum ram extension. Up to four tools can be mounted in the quad holder for automatic selection. That reduces tool change time and improvesproductivity. A lot of machines in this category don't have the guts to handle milling jobs like flange holes. Ours does. Just sayin’. One last thing before we wrap this up. A testimonial. This lineup of big machines is used by the most demanding, perfection-driven, quality-obsessed customer we have ever known in our company’s history: us. Yup, we designed and use these big machines to make our own products. And you know how picky we are.